Days after a San Antonio police officer was killed and another hospitalized in a shootout near downtown, two young girls are helping restore morale for the men and women in uniform. 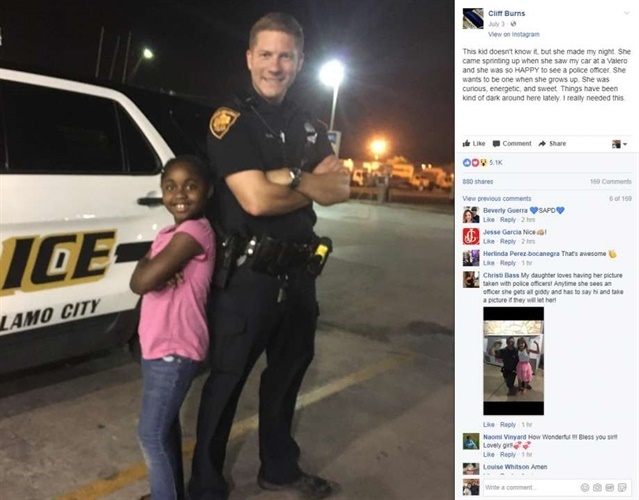 "This kid doesn't know it, but she made my night," said SAPD Officer Cliff Burns on Facebook of a touching impromptu interaction Monday. Burns posted a photo of him standing back-to-back with a young girl who he said ran up to him for a quick photo-op July 3, MySanAntonio.com reports. "She came sprinting up when she saw my car at a Valero and she was so happy to see a police officer," he said. "She wants to be one when she grows up. She was curios, energetic and sweet." Over in the downtown area on Wednesday, a woman captured a tender moment between her granddaughter Paige and eight SAPD officers. Martha Bosquez was not immediately available to return requests for comment, but explained the scene at the Luby's. "[...] she walks up to the table and ask them 'May I pray for you to be safe & so that God may take care of y'all,'" the post reads. "I must say that every one of them bowed their head when they got done eating." On June 29, Officers Miguel Moreno and Julio Cavazos were on patrol near San Antonio College when they went to approach a man in the area. When they stepped out of their patrol vehicle, Andrew C. Bice, 34, opened fire on the officers, striking Moreno in the head and Cavazos in the chest. Moreno succumbed to his injuries June 30 and Cavazos was released from the hospital Tuesday.